A lot of picturesque villages and small towns with early roman churches, abbeys and medieval castles are worth a visit. A beautiful 45-minutes ride along the river Tarn will lead you to Albi, the city of Toulouse Lautrec with its museum carrying his name, its impressive cathedral, nice markets and a quaint old centre. The town of Roquefort, with its caves where you can go and learn about the production of the famous blue-cheese, is on the way to Millau.There the highest crossover of the world was recently built and opened to traffic. 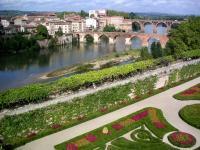 Day excursions can be made to the Gorges du Tarn and the old strongholds of the Knights Templar. In the summer many classical concerts are held in churches and abbeys. Music festivals take place out in the open. Each village and town has its own annual fair with a meal for inhabitants and visitors with a bal musette to follow. On July 14th there are fireworks and a big dancing party in Brousse-le-Chateau, famous for its picturesque setting and renovated castle. Many village or small towns pride theirself in markets where regional products are sold. There are evening markets where you can pick out specialties and compose your own dinner, to be enjoyed at long tables on the market square in the company of villagers and other visitors.